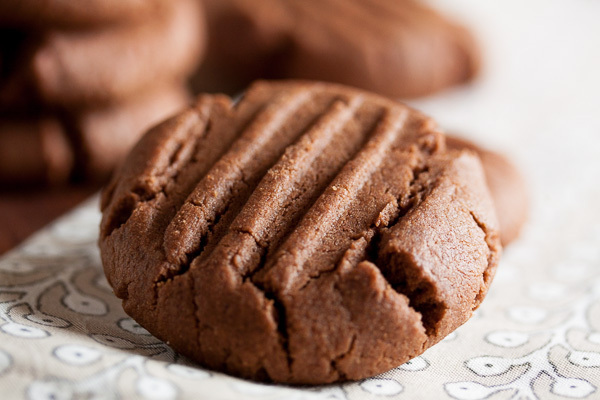 Chewy Peanut Butter Cookies | wanna come with? I’ve made a lot of peanut butter cookies in the past few years, but I’m not hearing any complaints. 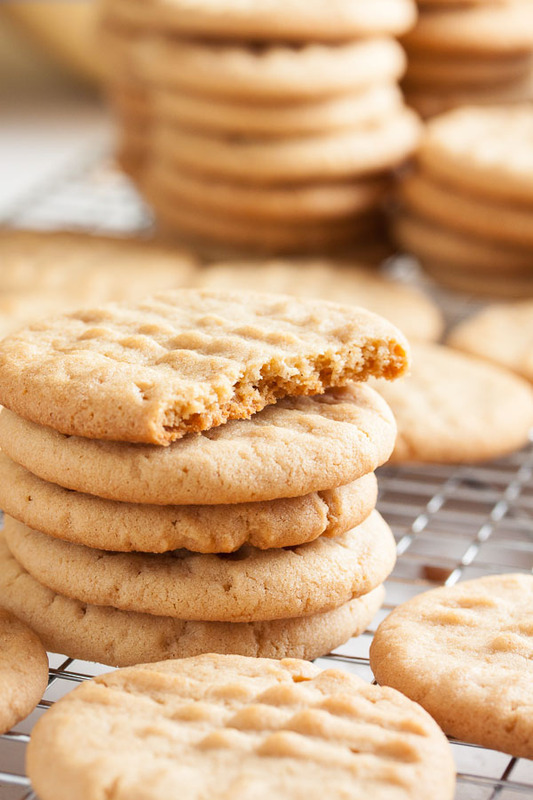 I think I could bring peanut butter cookies in every week and I still wouldn’t hear complaints – it’s a cookie everyone is always happy to see. And luckily there are a lot of variations out there, so I don’t think we’ll be running out of recipes any time soon. 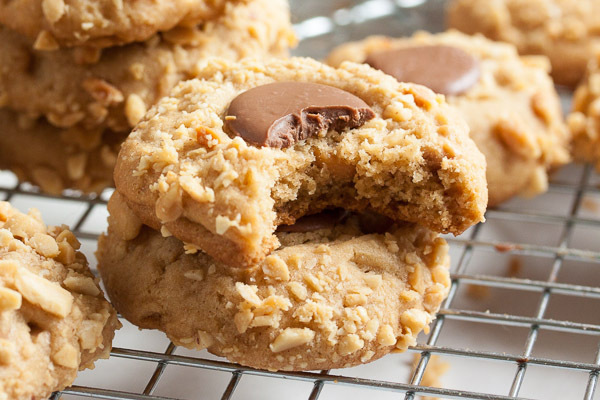 Whether it’s a crisp peanut butter cookie, or a soft one, whether it’s got crunchy nuts or chocolate chips added, or is just plain peanut butter like this one – it’s all good. The dough for this cookie is soft and fluffy, almost like a thick frosting. And with 2 eggs, plus both baking powder and baking soda, they spread out and puff up quite a bit as they bake. Then they drop back down, making them dense and chewy. The recipe says to bake for just 10 minutes, or until they begin to colour around the edges. Mine didn’t show any colour at 10 minutes, so I left them in until they did – about 13 minutes. After they’d cooled a bit, they were a little crunchy around the edges (nice! ), but still soft and chewy overall. In my experience, cookies like this are generally softer the next day. These cookies, however, got crunchier. Still a good cookie (I’m a fan of crunchy cookies), but they didn’t have the soft texture promised. Totally my fault. So don’t look for a lot of colour before you pull them out of the oven. Once they begin to brown, you’ve gone too far. 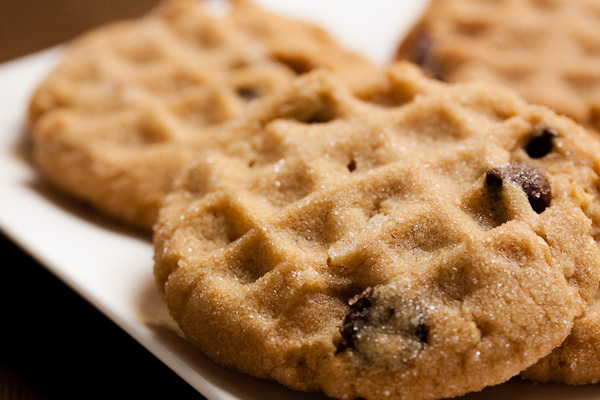 Once again – they’ll still be good, just not a soft peanut butter cookie. I really like this cookie. I think it would be absolutely perfect sandwiched with some banana ice cream, then drizzled with a bit of chocolate. Oh yeah. My recommendation is to bake them now before it gets too hot, and freeze some for ice cream sandwiches in the summer. Adapted from The Sweet Melissa Baking Book by Melissa Murphy. The original recipe says it will make 2 dozen cookies – I doubled the recipe and got 74 cookies. I'll assume I rolled my balls a little smaller than they did. In the bowl of a stand mixer fitted with the paddle attachment, beat the butter, sugars, and peanut butter together on medium speed until light and fluffy, about 3 or 4 minutes. Scrape down the sides of the bowl and add the eggs, one at a time, beating well after each. Form the dough into small balls and place about 2" apart on a baking sheet – these cookies will spread out quite a bit as they bake. Press the balls down slightly with the tines of a fork. Bake for about 10 minutes, until just barely beginning to brown around the edges, rotating the baking sheet halfway through the baking time. If you over bake these cookies, they'll end up crunchy rather than chewy – still a good cookie, but not necessarily the texture you want. Allow to cool on a wire rack for a few minutes before removing the cookies from the pan and allowing them to cool completely. 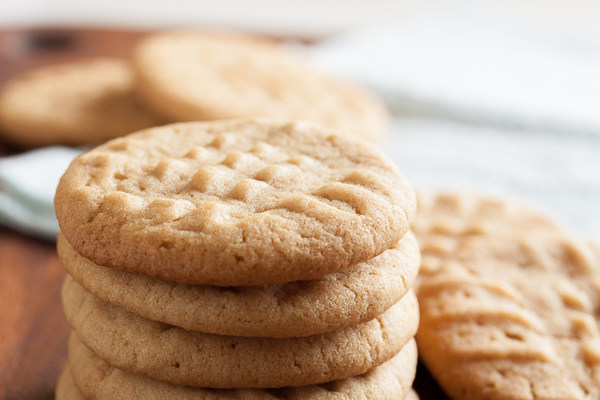 you can never go wrong with a classic peanut butter cookie. these look incredible! 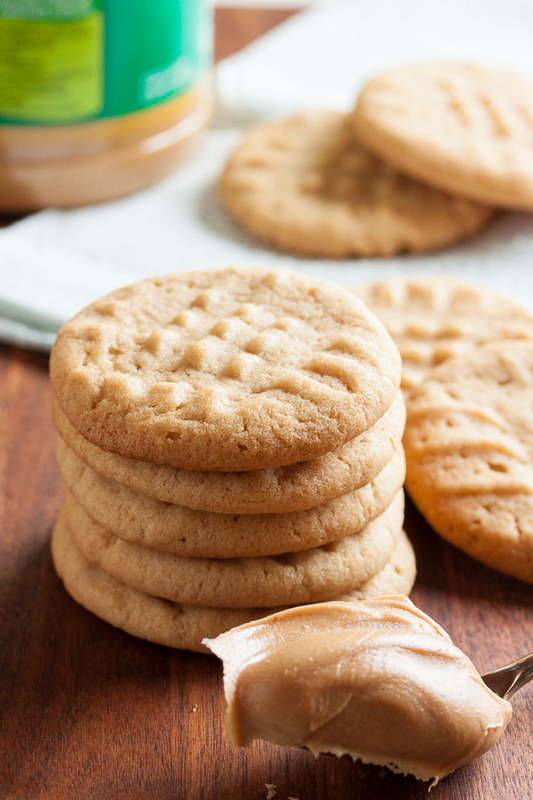 Sometimes I just get this craving for a good old fashioned PB cookie (or, like, a dozen of them) and this recipe is just what I need to take care of it! I cannot wait to try these! I get those cravings too Karly! But when they’re just for me, I’ll always add chocolate chips 🙂 Hope you enjoy them! 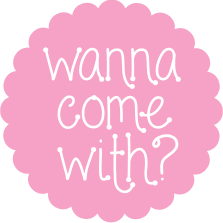 I’m dying to know where you grew up! I live just outside of Vancouver but grew up on Vancouver Island. Hey Karen, always happy to meet a fellow Vancouverite! I’m not originally from the coast though – I grew up in the interior, in Creston. Tiny, tiny town. Lots of beautiful orchards and mountains.